Ruben Kavan, 88, of Morse Bluff, Nebraska, died Saturday, June 16, 2018, at the Dunklau Gardens in Fremont. 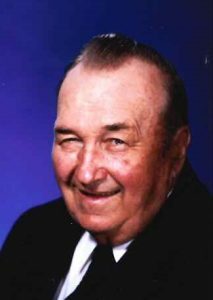 Funeral Service Wednesday, June 20, 2018 10:30 A.M.
Visitation Tuesday 5-7 P.M. Wednesday 9:30-10:30 A.M.
Ruben Kavan, 88, of Morse Bluff, Nebraska, passed away Saturday, June 16, at Dunklau Gardens Short‑Term Rehab in Fremont, Nebraska. He was born July 19, 1929, on a farm near Morse Bluff to Joseph L. and Tillie (Mach) Kavan. He attended District #54 rural grade school and District #14 in Morse Bluff through 10th grade. Ruben served in the U.S. Army during the Korean War from 1951 to 1953. When stationed in Korea, he served in the Company “K” 35th Infantry Regiment and his decorations included the Combat Infantry Badge. In March 2014, he was honored to participate in the Korean War Veterans Honor Flight to Washington, D.C.
Ruben married Ann Scholz on November 23, 1957, in Schuyler, Nebraska. Together they operated their dairy farm near Morse Bluff. In the 1970s, the family was recognized with the Nebraska Pioneer and Heritage Farm Award for consecutively held ownership of land in the John Kavan family for over 100 years. He was a farmer who enjoyed spending time with his family, polka music, talking with people, playing cards, and good food. Ruben was a member of the American Legion Post #340, North Bend V.F.W. #8223, and the Forty and Eight American Veteran’s Honor Society. He was also a member of the Morse Bluff Z.C.B.J. Lodge #9, Morse Bluff VFD, District #77 School Board, and past director and 50 year member of the Saunders County Livestock Feeders Association. Survivors include three daughters, Ruby and husband, Ray Urban Jr. of Malmo, Nebraska; Ruth and husband, Steve Bertone of Papillion, Nebraska; and Deann Souza of Fredericksburg, Virginia; two sons, Roland and wife, Kinley Kavan of Morse Bluff, Nebraska; and Dean Kavan of Fremont, Nebraska; two brothers, Joie Kavan of Fremont, Nebraska, and Lester and wife, Marlene Kavan of Des Moines, Iowa; two sisters, Maxine and husband, Bernard Kratky of Prague, Nebraska, and Joan Kavan of Wahoo, Nebraska; 7 grandchildren, 2 great-grandchildren, and many nieces and nephews. Ruben was preceded in death by his parents; wife, Ann; brothers, George G. and Richard R. Kavan; and sisters, Helen Settles and Marcella Shestak.